MiamiShared.com is an exclusive, one of a kind shared work environment catering to the individual entrepreneur, start up company, and small business owners of Miami. 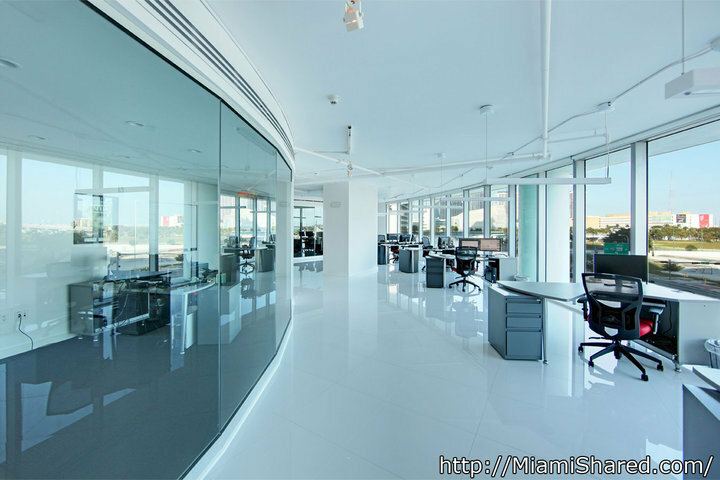 Located at 900 Biscayne Bay, across from the American Airlines Arena and surrounded by a wide array of restaurants, shops and parks, MiamiShared brings a new type of culture and vibe with its modern look of high ceilings, glass enclosed private offices and curved floor plan to the otherwise boring work setting. MiamiShared.com offers a variety of layouts and workstations to accommodate your needs at extremely affordable prices. Services included are super fast Internet and WIFI, a conference room with 60” screen, company logo placement, 24 hour front desk security and free valet parking. Optional services vary from private assigned parking spaces, computer leasing with dual monitors, web programming and editorial content services as well as personal assistant based services. As a member of this shared work community you also have the opportunity to take advantage of the free workshops and networking events that are offered each month at the office. The concept of co-working and shared work spaces has taken off at a rapid pace but MiamiShared has truly perfected the idea. They are laid back and trendy yet still offer the professional set up that is needed in an office. For more information log onto http://www.MiamiShared.com and enjoy their up to date blog. To schedule a tour of the office email your request to info@miamishared.com or call toll free (305) 929-8688 ext 117.